Buddha Purnima is the sacred occassion that reminds us of Lord buddha, one of the greatest spiritual leaders in history. Like millions of Buddhists and followers of Buddhist teachings, TheHolidaySpot wants to mark the occassion in its own way and so you have here some highly interesting puzzle activities based on Buddhism, Buddha Purnima and Lord Buddha. 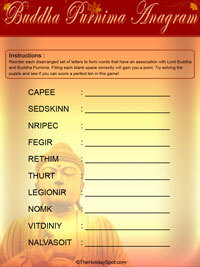 Try these Buddha Purnima Puzzle Activities and celebrate the festival in a slightly different way. 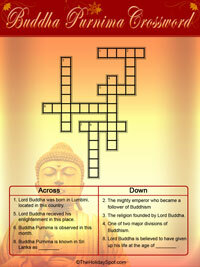 If you want to share these Buddha Purnima Puzzle Activities with your friends, just click here to refer this page to them. Wish you a happy Buddha Purnima! 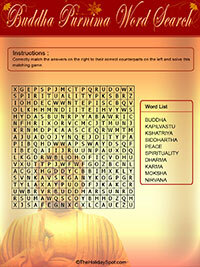 Indulge in an unconventional celebration of Buddha Purnima with these thematic puzzle activities.